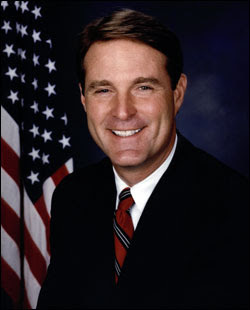 The Washington Post's Jonathan Capeheart calls Evan Bayh's retirement a "brain drain." Hmm. How to out this. I once had the chance, along with numerous other reporters and editors, to speak with Bayh in an off-the-record context. I'd say the group was quite favorably disposed toward him going into the discussion -- here was a young, popular, telegenic moderate Democrat everybody could see on a presidential ticket soon. As far as I could tell, everybody came away thoroughly unimpressed. He said nothing especially disagreeable, it was just that he seemed so mediocre. He expressed himself entirely in terms of platitudes. Not a single interesting thought escaped his lips. This wasn't a function of him avoiding uncomfortable positions. I've seen smart politicians dance around questions, and this wasn't that. This was just a completely unremarkable man who, had he not been the hansome son of a famous politician, would never in a million years have been a Senator. If Bayh's loss is a "brain drain," then the Senate is in even worse shape than I thought.